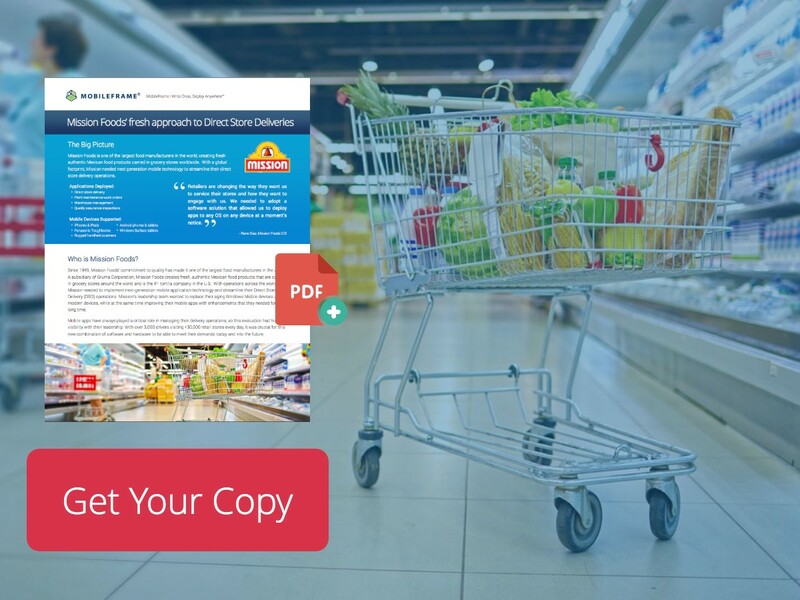 With over 4,500 drivers who visit at least 30,000 retail stores every day in the United States, Mexico, and Central America, Mission Foods sought to implement next-generation mobile application technology and streamline their Direct Store Delivery operations. Mission’s leadership team wanted to replace their aging Windows Mobile devices with modern devices and improve their mobile apps with enhancements that were long overdue. It was critical for this new combination of software and hardware technology to be able to meet their demands today and into the future. The team at Mission Foods selected MobileFrame primarily for its no-code development approach and cross-platform support of Android, iOS, Windows and the web. The ability to write one app for all devices using a single, integrated platform was a key factor in selecting MobileFrame as Mission’s mobility standard. The IT team at Mission Foods now builds pixel-perfect apps designed specifically for the way they do business, with the option to choose the right device for the job for each division. They’re using MobileFrame’s platform to eliminate manual processes across the entire company and deploying apps for warehouse management, plant work orders and quality assurance just to name a few.